Oak Hill offers two camps, specifically designed for people with disabilities. 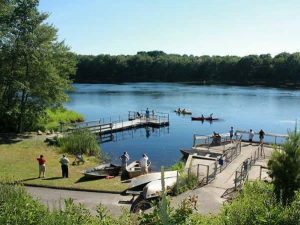 The camps, located in Waterford, CT and Amston, CT are packed with adapted recreational activities such as swimming, hiking and boating. Each camp is set in a beautiful natural location with fully accessible amenities. Residential summer camp set on the Connecticut shore line. Campers include youth and adults with developmental, intellectual, physical and sensory disabilities, including visual impairments. Residential summer camp set in the peaceful woods of Amston, CT. Campers include youth and adults with developmental, intellectual, physical, and sensory disabilities, including visual impairments. For more information about Camp Hemlocks, please contact Jillian McCarthy by phone at 860.228.0393 ext. 4068, or email at jillian.mccarthy@OakHillCT.org. To sponsor a camper or make a gift please donate online or contact the Development office at 860.769.3854. We are the proud affiliate of Easterseals. For 100 years, Easterseals has served as an indispensable resource for individuals with disabilities, veterans, seniors and their families. Easterseals affiliates in communities nationwide serve 1.5M people through high-quality programs including autism services, early intervention, workforce development, adult day care and more.